Feel like you’re the big fish in the small Texan town of Dillon? 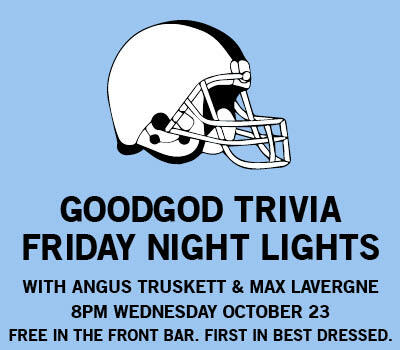 Well pack up your gridiron gear, spread your wings and come have Angus Truskett and Max Lavergne test your knowledge on all things Friday Night Lights! You never know… you might meet your very own Lyla Garrity or Tim Riggins. Please note, we are not taking bookings for these events. Seating is on a first-come first-served basis!